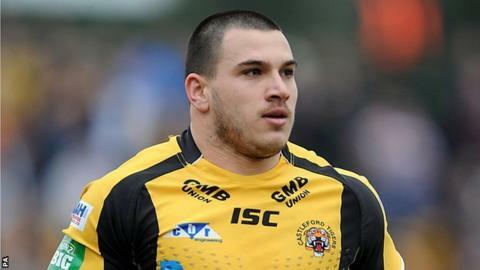 Justin Carney ran in a hat-trick of tries as Castleford swept past Batley and into the Challenge Cup fifth round. Championship outfit Batley had performed impressively to remain within a converted score of their Super League opponents going into half-time. But the Tigers pulled clear in the second half, adding seven more tries. Luke Dorn crossed twice, while Jamie Ellis, Marc Sneyd, James Clare and Scott Wheeldon also went over for the Tigers, who play Sheffield Eagles next. Josh Griffin and Lee Paterson replied with tries for the Bulldogs. "They found a weakness and went for it again and again. "It shows how clinical you have to be in elite sport. I thought Castleford were very good. They play a high-tempo game and took their chances well." "This can be a hard place to come. Batley have made it a tough place for Super League clubs. But I thought the players responded well to the challenge. "Luke Dorn and Marc Sneyd helped us get a grip in the first half and then after the break I thought we were excellent." Batley Bulldogs: Greenwood; Paterson, Bretherton, Griffin, Finigan; Davies, Leatherbarrow; Smith, Blake, Gledhill, Martin, Scott, Applegarth. Replacements: Rowe, Leak, Leary, Chandler. Castleford Tigers: Dorn; Clare, Channing, Shenton, Carney; Sneyd, Finn; Lynch, Milner, Wheeldon, Holmes, Hauraki, Massey. Replacements: Boyle, Mariano, Ellis, Fleming.